What Is a Drug Test Anyway? If you are facing drug testing, you may have many questions about how this process works. You may find yourself asking what is a drug test? In layman's terms, a drug test is a test that can detect whether or not you have consumed different types of drugs. The federal government has set standards for substance testing. The Substance Abuse and Mental Health Services Administration (SAMHSA) has set forth a list of five drugs for which employers and government bodies generally test. These drugs are marijuana (cannabinoids), cocaine, amphetamines, opiates and phencyclidine (PCP). Fat soluble drugs like Marijuana stay in the body longer than water-soluble drugs like Cocaine, and so are most frequently detected in the basic urine test. However other tests, like the hair test, can detect use even after the substance has left the body. This is the type of drug test most often used by employers. Urine drug tests can also be purchased for at-home use. Urine drug tests generally detect drugs used within a week of testing. Though some tests give almost instant results, they must always be sent to a lab for verification. Drug tests that use a hair sample are generally able to detect the use of drugs over a much longer period of time than any other type of drug test. Hair tests are sometimes used to determine when an individual ceased using certain types of drugs. Hair drug testing requires a 10-15 strand sample about 1.5 inches in length, and it’s usually taken from the back of the head. However, if the test subject is balding, hair can be taken from body parts such as leg, arm, chest, and pubic area, although facial hair is rarely used. The hair test can detect drug use accurately for the previous three months regardless of whether the drug is still in your body or not. Hair testing is generally conducted by both public and private sector employers. While not as popular as the urine test, hair testing is being used more often as the cost has come down to reasonable levels. Saliva tests are generally used to detect the presence of drug use within a few days prior to the administration of the test. These types of tests are not yet federally regulated. While they are convenient, the results they produce may not be considered valid in a court of law. While blood drug testing is the most effective type of test, it is also the most expensive form of testing. For this reason, blood tests are generally used only by law enforcement agencies who plan on pressing charges against an individual. They are also used by sports regulation associations that wish to test professional athletes for steroid use. 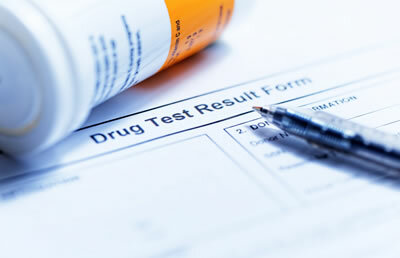 Many individuals who face a drug test are concerned about what will happen if they test positive for controlled substances. Most individuals who take such tests do so as part of the pre-employment screening process. When job candidates fail drug tests, they are generally not hired. Refusing to hire someone based upon drug test results in legal in many areas of the U.S.